When I first saw these I thought "the toy industry has officially run out of ideas" but the artwork is crazy-cute. The chicks themselves are cute, but I'm not overly fond of every facial expression, some are cute though! Not sure how to feel about the hair being a bit on the coarse side though, but I do like that the hair is actually rooted and not just a cheap-o wig. That's about what I was thinking when I saw them, too, but they've grown on us. The rooted hair was the clencher. I kind of do feel like they might be a one wave kind of thing, but who knows? I've seen no ads, and no one else has bought any, but our area is definitely not a good one to judge on how things sell. I'm not a fan of all of the faces, either. Same with the hair. I love the short bobs and the long curls the most. I forgot to add on the first post they had a strip of plastic over the eyes and hair, and they're just in a clear bag. As much as we've shaken some boxes around, I hope that plastic is enough to keep the hair styled. Awwww! These remind me of the Fairy Tails birds from the 80s! I just wish the eyes were more detailed/pretty. Still... I know I’m going to end up with a few of these. We found them at Walmart. I'm not sure about other locations, I'm not near any to check. Good news is I don't see any rarities, so none should wind up being highly expensive. Kinda disappointed that they don’t have actual wigs, though. Being able to mix and match wigs and chicks would be a fun idea, imo. My sister got two more tonight, Karen and Jo Marie. She's not sure about keeping Jo Marie, so she's staying in her bag for now. Honestly, looking at more than one, there's some cute little details. The beaks are different, and Karen's beak is open. Karen for some reason didn't have the plastic on her face, but Jo Marie does, if you can kind of see it in the bag here. I do kind of wish they had wigs, it'd be nice to put the hair you like with the faces you like. The purple hair is definitely softer and less coarse than the pink. I WAS WONDERING ABOUT THESE. Are they hard plastic or more of a soft, rubbery vinyl like MLPs? They totally remind me of MLP/My Little Kitty/Fairy Tail Birds aswell!! If they stick around long enough for Wave 2 I might get interested if some green or blue ones come out. I've been looking around for them when we go out, and so far have only seen them at the Walmart here. My sister's happy, though, she's the only one getting them. I don't know if we've gotten them first or if the other stores still haven't rotated stock or what. Konzern, Has your sister ended up with any doubles yet that she wants to get rid of? She has one she doesn't like as much that she'd part with. So far, no doubles. I'm wondering, since i haven't really looked at the boxes so much, since there's two dozen, and 12 per case, there should not be repeats per case. Having touched others as well, it's only Amanda's pink hair that's kind of coarse. The others feel very nice. I don't know if it's the color or type, the long hair itself, or just a bad one. Haven't found anymore with long hair yet. 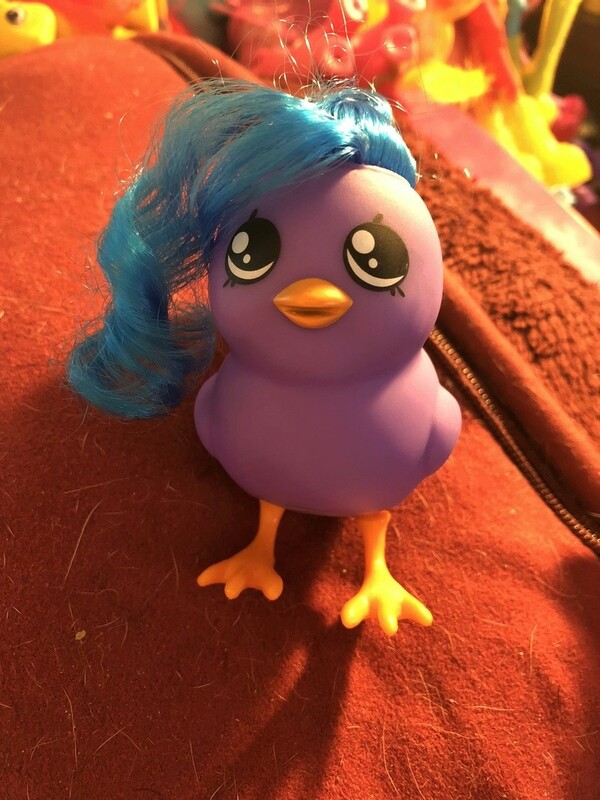 My sister has not bought one in a while, but she got one last night, Missy Chick. Her hair also feels great Seems like it might just be that pink. I haven't been able to find them at any other Walmart, just the one case at ours. I broke down and ordered one from Amazon for $7.50...twice as much as I should have paid, but It was a birthday present to myself...I am so happy with teh one I got, she's adorable!!!! LURVE teh hair color, she's perfection!!! She's got that windblown look! She's so cute!